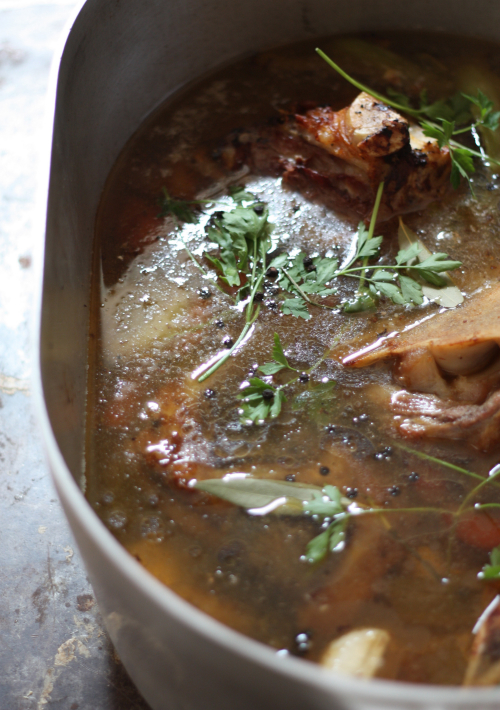 I've shown how simple it can be to make a turkey broth or stock from scratch using ingredients you have around the house here on the blog before — it's one of those things that you may think is labor intensive and to a degree it is, but in my opinion so worth the afternoon simmering on the stovetop for what you get out of it. 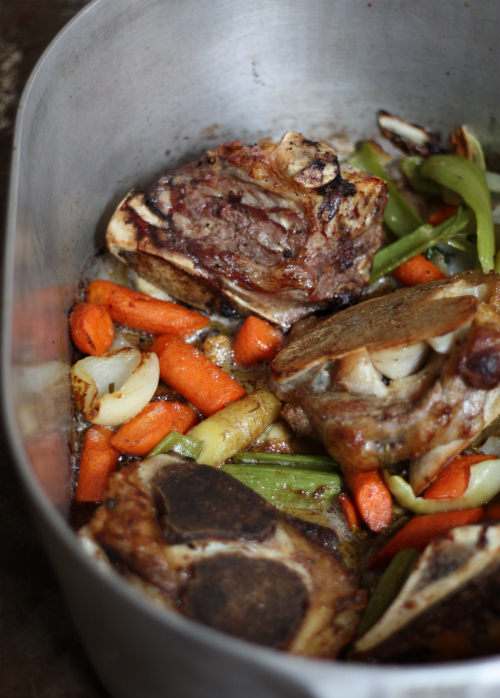 Stocks and broths are so versatile, you can make them with most any meat base and utilize the vegetables you have on hand. Trying to be frugal, there are several ways to make this job a little easier — first off save your onion, carrot, turnip and parsley scraps as opposed to tossing them in the compost (you are composting right?). Just keep a bag in the freezer and add your scraps as they collect. 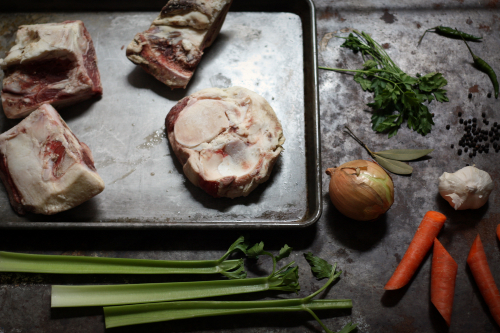 Over time you will have a bag full of great items to toss into a hearty homemade stock. 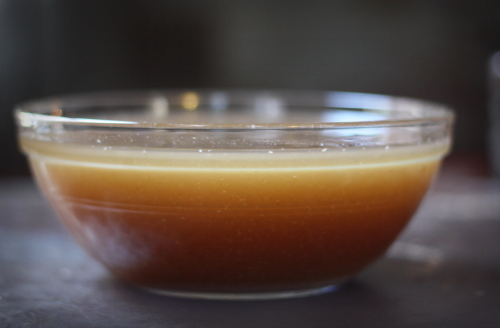 Secondly, when you need some stock for a recipe it's nice to go to the freezer and pull your own homemade stock out as opposed to adding that item to a grocery list — your recipe will also turn out that much better! 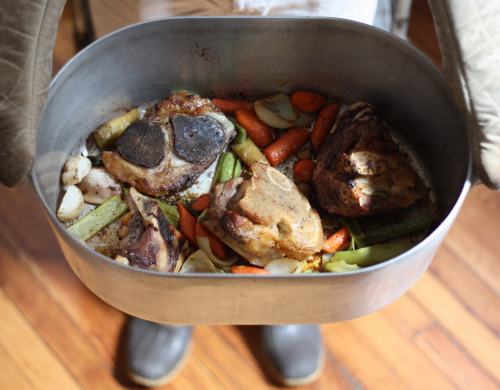 Preheat an ovenproof stock pan large enough for the bones and ingredients to 450 degrees inside the oven. Once heated add the olive oil, swirling to coat the bottom of the pan and toss in the beef bones. Return to the oven and roast for 30 minutes. 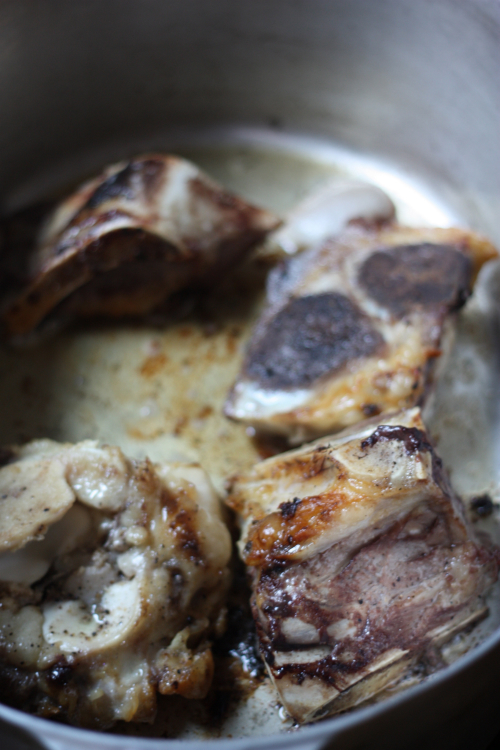 Occasionally, turn the bones in the pan allowing them to brown on all sides. Remove from oven and add all of the vegetables, stirring to coat in the pan juices. Return to the oven for an additional 30 minutes, again stirring on occasion to coat and caramelize the vegetables. After 30 minutes you should see a nice color on the meat and vegetables, so now we are ready for the liquids and the spices! Pour bourbon and water to cover the bones. Then incorporate parsley, Thai chili, peppercorns and bay leaves. Return your pan to a stovetop and bring to a boil. 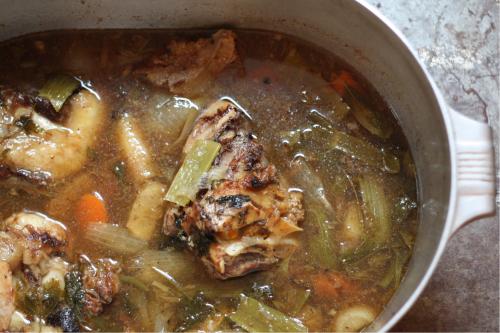 Once boiling, stir, cover and reduce, simmering for about 4 hours, stirring on occasion and adding water to keep the stock above the ingredients if needed. After 4 hours your house will smell like on big Sunday pot roast has been cooking! 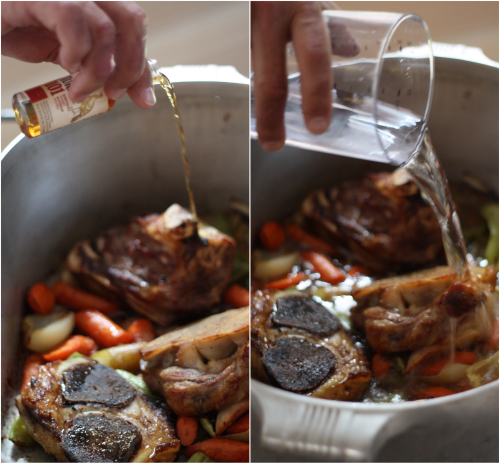 Allow the stock to cool slightly. You can remove the larger pieces with a spoon and discard. The rest of the liquid can be run through a colander then through a fine mesh sieve. 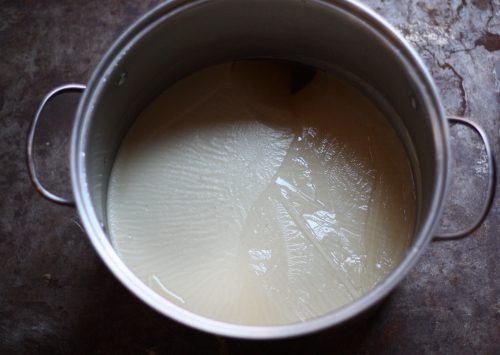 Refrigerate the broth overnight — this will allow the fat to settle on top. 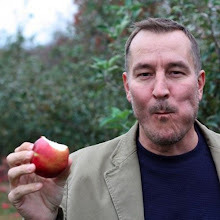 The next morning simply break the fat with a spoon and discard. This will leave you with a beautiful dark, rich, and caramelized spicy broth good for soups, stews, and other recipes (including one I have for you coming up on Wednesday). Place into individual containers and freeze in 1-2 cup increments, allowing you to pull these out portioned for recipes. 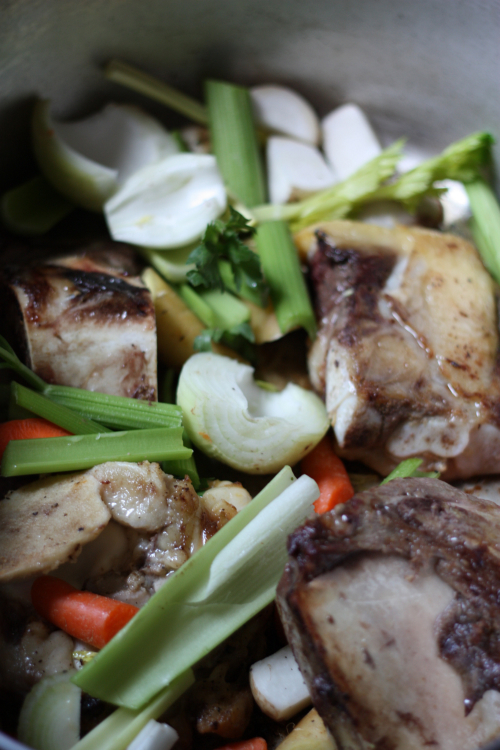 As mentioned in the opening of this post, the overall process may seem a little cumbersome but once it is done there is nothing better than using your own broth in the recipes you create!